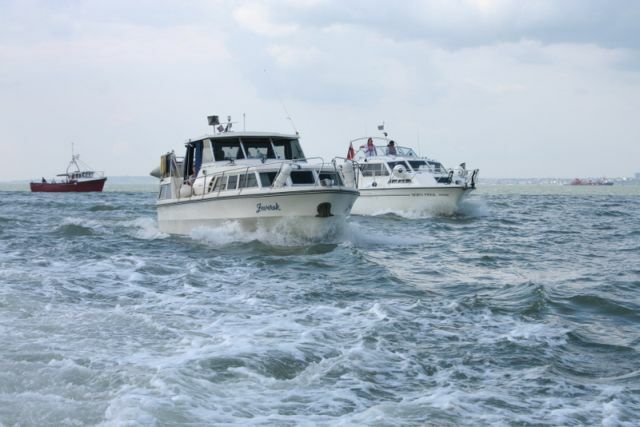 A week's cruise to the River Medway. It rained. Heavy, steady rain of the feline and canine variety that disrupts traffic and delays enthusiasts from getting to their boats. 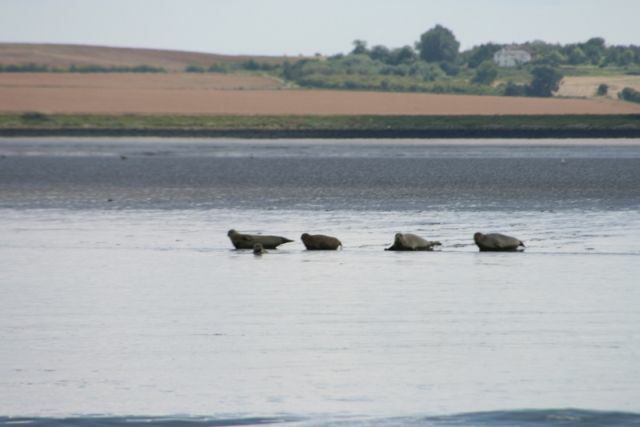 However, it failed to dampen our spirits and Miss Pud’n and Born Free departed their moorings on Friday afternoon. By now the sky was clearing and the sun managed to poke out, tentatively, from behind breaks in the thin cloud. 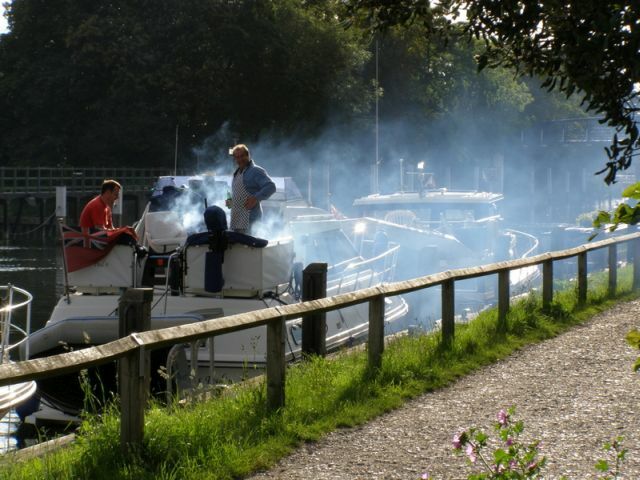 Bob Tapp and Mark Darby welcomed us onto our moorings at Teddington where Barry’s attempt to barbecue his fish fingers attracted the attention of a local duck despite the smoke billowing out of the after deck on Miss Pud’n. Tahoe and Prime Time arrived later that evening, completing the party. Saturday morning dawned with sunshine. 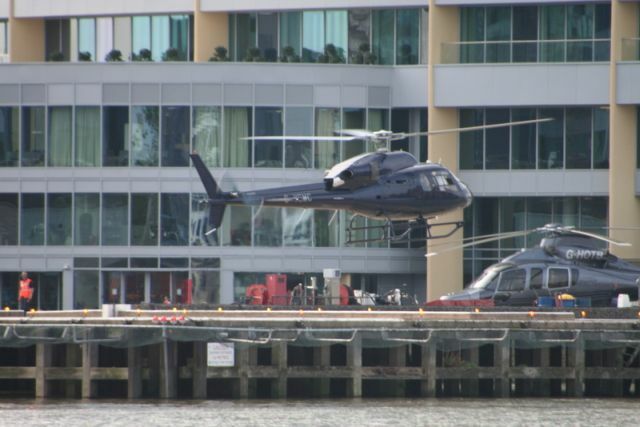 Departing on schedule, we made an easy passage to Imperial Wharf at Chelsea. A leisurely stroll in the Kings Road, a close inspection of the boats in Chelsea Harbour and a substantial meal out occupied our time there, as did viewing (and hearing) the constant apparently precarious comings and goings of the helicopters on the pad of the London Heliport. We departed next morning for the main leg of our passage, in sunshine. Light traffic made for a smooth passage through the Pool of London, providing no inkling of the problems to come. 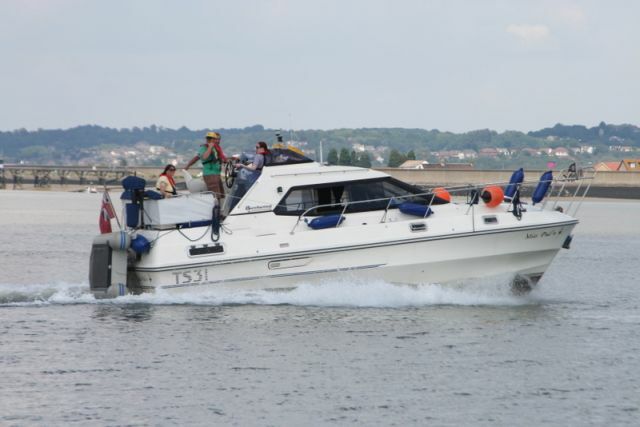 A few hours into the passage Miss Pud’n reported an overheating port engine. A suspected broken drive belt turned out, on inspection, to be a more serious malfunction. The alternator pulley had detached itself from its spindle and now nestled comfortably in the bilge along with the retaining nut and drive belt. Ever resourceful, Barry climbed into the engine bay and completed a running repair, which hardly slowed the convoy. Confident in his handiwork, a little later he powered his boat on to the plane to do a spectacular 14 knots! 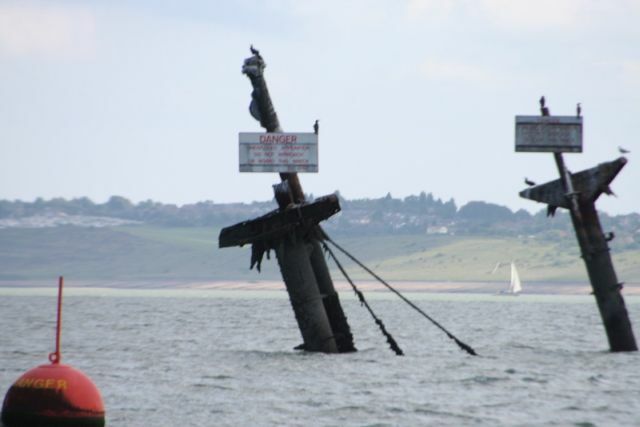 Before we left the Thames for the Medway, our passage took us on a small deviation to the north end of the Sheerness middle sands, off the Nore, to inspect the wreck of the SS Richard Montgomery, a wartime supply vessel that still holds some 1500 tonnes of highly explosive TNT. Our convoy, looking every bit like an invading armada, made the passage to Rochester sans Miss Pud’n, which left us for Chatham, arriving pretty much on schedule. Born Free organised temporary, substitute facilities for a non-functioning battery charger, but all the boats made it to the destination safely. 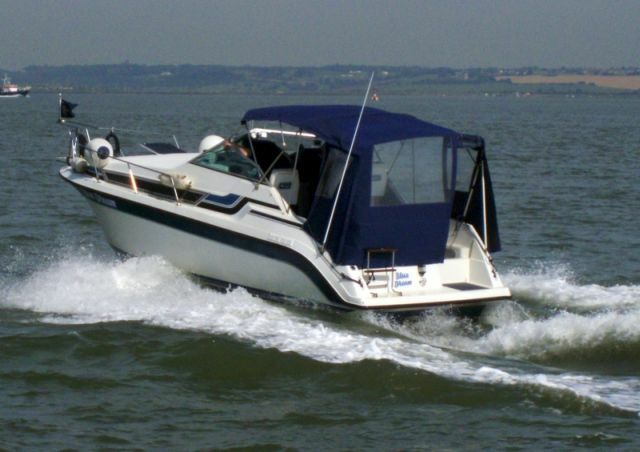 The welcome at Rochester Cruising Club was genuine and warm. We dined sumptuously in the clubhouse, which had remained open that evening, muchas gracias, for our visit. 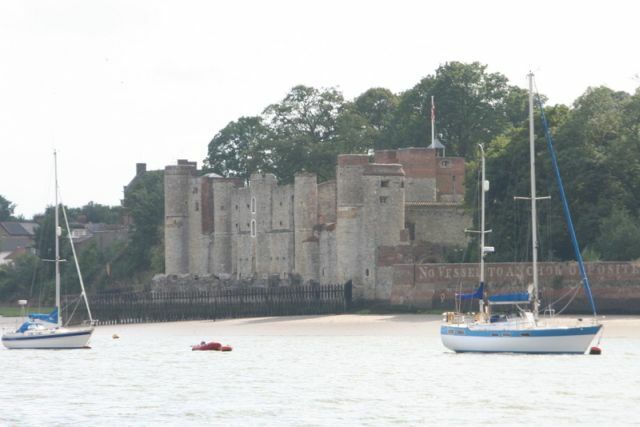 The next morning saw us visit Upnor Castle, a key feature of the defence of the fleet in the 16th Century, and in use as a naval store well into the 20th Century, before becoming a museum. The weather was kind. Light cloud predominated our sojourn in Rochester where the 12th Century Castle, the attractive Dickinsian High Street, the museum and eateries received our eager attention. 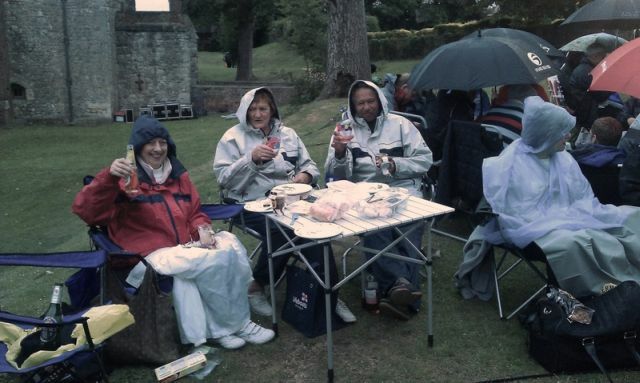 The Seagers and de Moraes contingent indulged their cultural sensibilities, enjoying an open-air production of Shakespeare’s A Comedy of Errors while the remaining contingent indulged in pasta and pizza! On Wednesday we departed for the short run to Chatham. The marina here is a well-developed MDL facility, more formal than the friendly club atmosphere we had left behind. A visit to the nearby factory outlet and the task of identifying eating-places were high on the list of priorities. The Naval Dockyards provided much interest for everyone the next day and Neville even got the opportunity to make a piece of rope on the traditional 200 year old machinery. The ropery remains to this day a live production facility for specialist rope, and some of us got to chat with Fred, a retired rope maker who was splicing ropes for use by Cory to tow waste barges on the Thames. 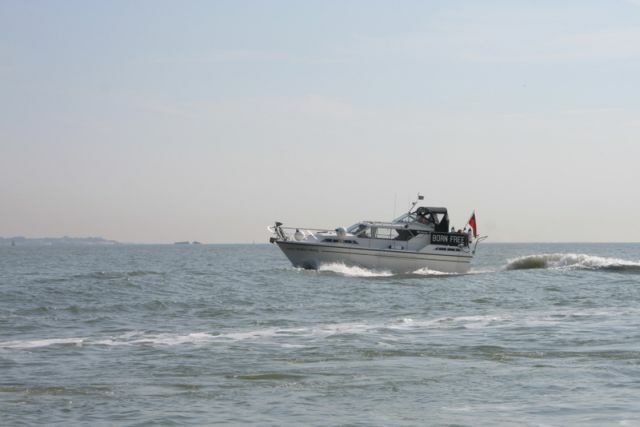 A weather forecast for Friday – force 7-9 in the channel – belied the conditions we were witnessing and had experienced all week. Keeping a keen eye on the weather, David Seager repeatedly consulted his electronic gizmo for live updates. Slowly it became apparent that that forecast was a rogue and the conditions for the return passage were, indeed, good. 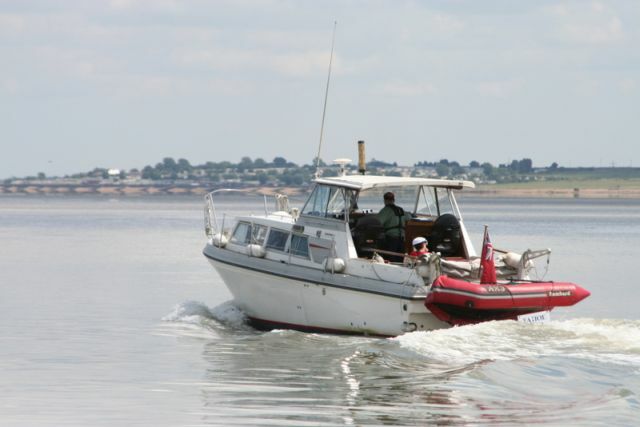 We left at 7.30 and made an uneventful passage on an ebb tide down the Medway and on a flood tide back up the Thames estuary. All the skippers tested their boats – at some time or another – at high speed, which made for some interesting viewing and excellent photographic opportunities on the return passage. The main contingent made for St Katherine’s Dock while Born Free and Miss Pud’n made straight for Teddington, intent on getting up to Runnymede for Saturday afternoon, attracted by the prospect of scones and strawberry jam. Tahoe experienced an engine malfunction (in the Dock) because of a fractured power cable and a trim tab that had become loose on the other engine. Both items were quickly repaired. Blue Dream left in the rain on Saturday for the passage to Teddington, while Prime Time, Jeverek and Tahoe stayed on for another night in London, enjoying a theatre visit before returning on Sunday. Another club event had come to a successful conclusion. It had provided enjoyment, new experiences, and opportunities to play. It had also reinforced the camaraderie that is so characteristic of the club. But it doesn’t stop there. There is always the opportunity to learn. Firstly, it became apparent throughout the cruise that our standards of radio communications could have been better. A tutorial/revision on communications as part of a summer event would be instructive. Perhaps even revisiting our club procedures and formalising them for future cruises would be useful. The incident of the wayward alternator pulley also provided an opportunity to reflect. Familiarity with the engine bay and key components of the engine is paramount to being able to identify problems when they arise. Even if the failure is beyond one’s own ability to carry out a running repair, being able to communicate explicitly the cause of the problem can often improve one’s chances of getting it put right. 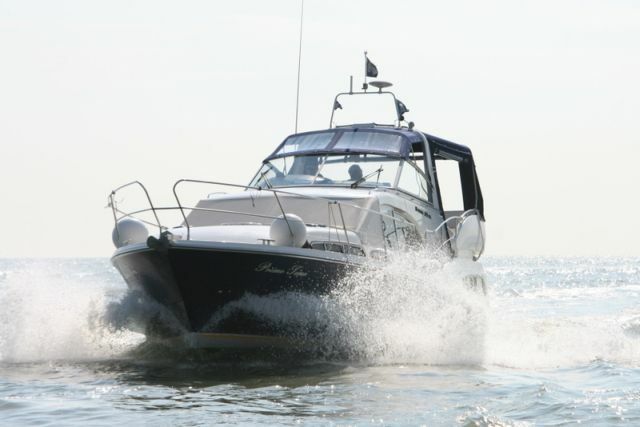 It also points to the need for the skipper to ensure that the inventory for each cruise contains adequate tools and spares o enable a running repair to be carried out in case of need. Carrying the appropriate charts is also a key safety feature. The assumption that one can ‘follow the boat in front’ presumes that visual contact remains good. Knowing the passage plan and navigational points is a vital part of the cruise and keeping track of one’s whereabouts on the passage makes for a safer trip. Possibly this too can be a useful tutorial for a club event. 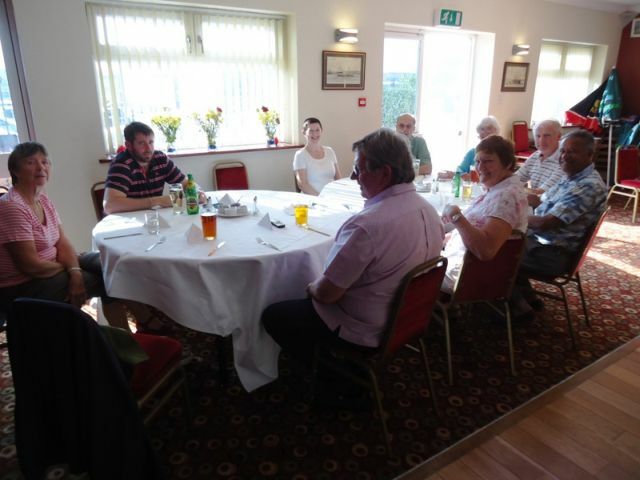 Getting to know others and enjoying the company of fellow club members is an important feature of club events. This passage certainly helped to bond its participants and provided ample opportunities to mix and socialise. Our sincere appreciation for the thorough preparation for this cruise go to Bob Tapp and David Seager and our thanks also for their patient leadership, constant guidance and congenial company throughout the trip.